(CNN) -- English Premier League side Chelsea have confirmed a second offer from league rivals Manchester City for England and club captain John Terry has been turned down. Chelsea have confirmed that John Terry is "not for sale." In a statement on the club's Web site Chelsea said an offer for the 28-year-old central defender had been "completely rejected following a similar approach last season." The statement added: "We would not entertain any conversation on the subject. John has reiterated his total commitment to Chelsea. We would like to make clear, and will not do so again, that John is not for sale." The club did not disclose the value of the bid that had been offered for the player. Terry, who joined the club at the age of 14, skippered the side who lifted the FA Cup last season; a trophy that adds to a haul that already includes one other FA Cup, two League Cup wins and two league titles attained as captain. Having made his England debut in 2003, Terry has been a key player for both club and country ever since, prompting former coach Jose Mourinho to hail him as "the best center-back in the world." 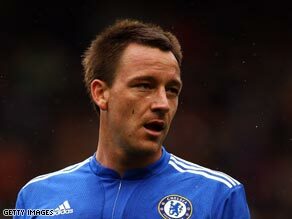 Terry has appeared in over 400 games for the Blues and is held in such high regard by the club he was offered a five-year contract in 2007 that will keep him at Stamford Bridge until 2012. The move from Manchester City, who are owned by billionaire Sheikh Mansour and associates from Abu Dhabi, follows some big money signings by the Eastlands club as they aim to finish among the top clubs in the division and qualify for the Champions League. Paraguay striker Roque Santa Cruz completed his move from Blackburn Rovers in a $30m deal while England midfielder Gareth Barry was acquired for $20m from Aston Villa. Speculation is also rife that further forays into the market will see City land Argentina striker Carlos Tevez from arch-rivals Manchester United and Cameroon hot-shot Samuel Eto'o from Barcelona before the start of the new campaign.